In this post I want to tell you about one of the biggest project in my career , children’s book “BBC Radio Cat”. This is collaboration with “Clever Fox Press” for the BBC Radio Station’s 95th birthday anniversary! The protagonist – Tommy – is travelling in the old and new BBC Radio station and tells the children about its history from the beginning till the nowadays! to the world of sports (Nānākuli, the one-Eyed Rescue Cat in Hawaii, became the first feline surfer recorded in the history of feline-kind). And while listeners are enjoying the lovely miaow mixing of music featuring titles that clawed their way to the top 10 in the charts, Tommy tells his little readers about the history of radio and the British Broadcasting Company. BBC began gathering families around bulky old radio sets in 1922, back in the day when television and internet were still non-existing terms. From Children’s Hour, the first children’s program aired on BBC radio, to CBeebies, the modern day’s weekly broadcast, Tommy tells how children were always an important part of BBC radio’s audience. And for those little readers interested in technology, Tommy offers a tour around the studio and explains what the varies microphones, displays, mixers, monitors and speakers are used for. Join Tommy, our Radio Cat , in his BBC radio studio, to celebrate 95 years since BBC’s first broadcast on 14th of November 1922. 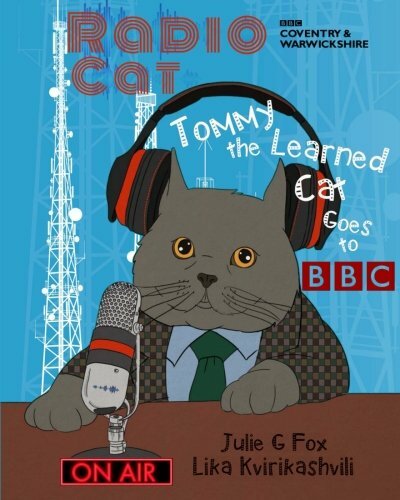 ‘Radio Cat: Tommy the Learned Cat goes to BBC’ is out and available on Amazon sites worldwide. This book is a special gift to BBC Coventry & Warwickshire. The first 10 copies will be presented to our BBC Local Radio service serving the county of Warwickshire (94.8, 103.7 and 104 MHz FM) on BBC's 95th birthday. სპორტის სამყაროში (Nānākul,ცალთვალა კატა ჰავაიდან, გახდა პირველი სერფერი კატა სერფინგის ისტორიაში). სანამ მსმენელი უსმენს მომხიბვლელ "miaow" სიმღერებს,რომლებიც ჩარტების პირველ ათეულშია, Tommy უყვება თავის პატარა მსმენელებს რადიო სადგურის ისტორიის და ბრიტანეთის სამაუწყებლო კომპანიის შესახებ. BBC რადიომ ოჯახების შეგროვება დაიწყო ძველებური რადიო გადამცემების გარშემო 1922 წელს, მაშინ, როდესაც ტელევიზია და ინტერნეტი ჯერ კიდევ არ არსებობდა. პირველი საბავშვო გადაცემა BBC რადიოზე, CBeebies,რომელიც დღეს ყოველკვირეულად გადის ეთერში, Tommy მოგვითხრობს, თუ რაოდენ მნიშვნელოვანი ნაწილი არიან ბავშვები BBC რადიოს აუდიტორიის. და იმ პატარა მსმენელებს,რომლებიც ტექნოლოგიით ინტერესდებიან, Tommy სთავაზობს ტურს რადიო სტუდიაში და მოუთხრობს, თუ როგორ გამოიყენება მიკროფონები, მონიტორები, მიქსერები და სხვა რადიო სადგურის დანადგარები. შემოუერთდით Tommy-ის, ჩვენც რადიო კატას, მის BBC რადიო სტუდიაში, რადიო სადგურის 95 წლის იუბილეს აღსანიშნავად,რომლის პირველი გადაცემა გავიდა 14 ნოემბერს 1922 წელს. ‘Radio Cat: Tommy the Learned Cat goes to BBC’ ხელმისაწვდომია cleverfoxpress.com-ze, amazon-ze და ჩემი საიტის Shop-ში.ეს წიგნი სპეციალური საჩუქარია BBC Coventry & Warwickshire- თვის. პირველი 10 ეგზემპლარი გადაეცემა ჩვენს BBC 95-ე დაბადების დღეს (94.8, 103.7 და 104 MHz FM).